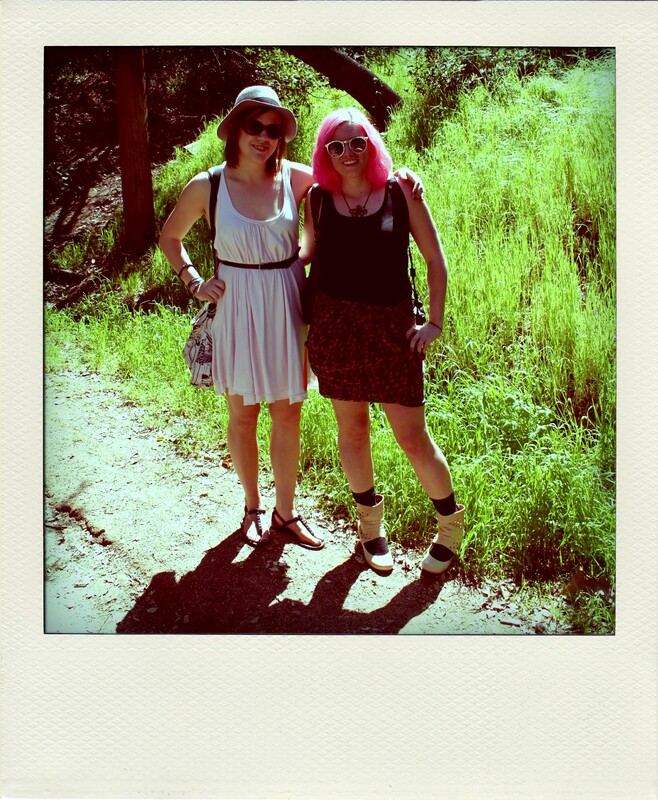 Recently Megan invited me on an Offbeat Frontier adventure. 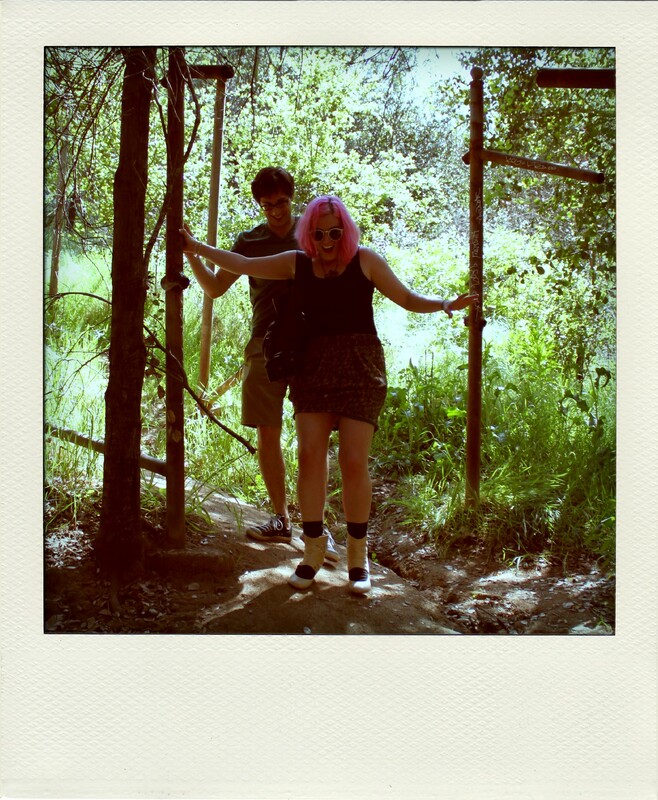 This “adventure” was to visit the LA Zoo ruins in Griffith Park. Although Griffith Park is known for it’s hiking, which means hills and dirt trails I assumed we would just be walking about the site, taking photos. Nothing serious. I mean aren’t don’t all zoos have paved walk-ways? After consulting Megan we concurred that we could dress us since we will just be walking around concrete side walks. There might be a little dirt but definitely no hiking. Not to mention my fashionable friends who were visiting me for the weekend had just left that morning so I was feeling inspired! I wanted to look good: fashionable yet comfortable. So I put on my new Kill City pink shirt/dress, some black studded sandals, and a belt and thought I was prepared. Megan put on her chiffon printed drape skirt, a black tank, and these Derby Darling Booties (which have a 2.5 inch heel). That may not seem very high, but for someone who NEVER wears heels, that is high. Then throw in some loose dirt hills. I’m surprised we came out relatively unscathed. Today I came across this article on “How to Walk in High Heels.” I thought that’s great advice but that doesn’t apply to all situations. Take shorter steps (striding is for professionals), & walk in a heel-toe motion. Try to distribute most of the weight across the ball of your foot. Stand up straight — you will initially feel unbalanced, but you’re not. The heel will support you. Keep your legs together as you walk & try not to bend them more than you normally would. After our experience this weekend I wanted to share what I learned from Megan’s experience in case you ever get caught in this situation. 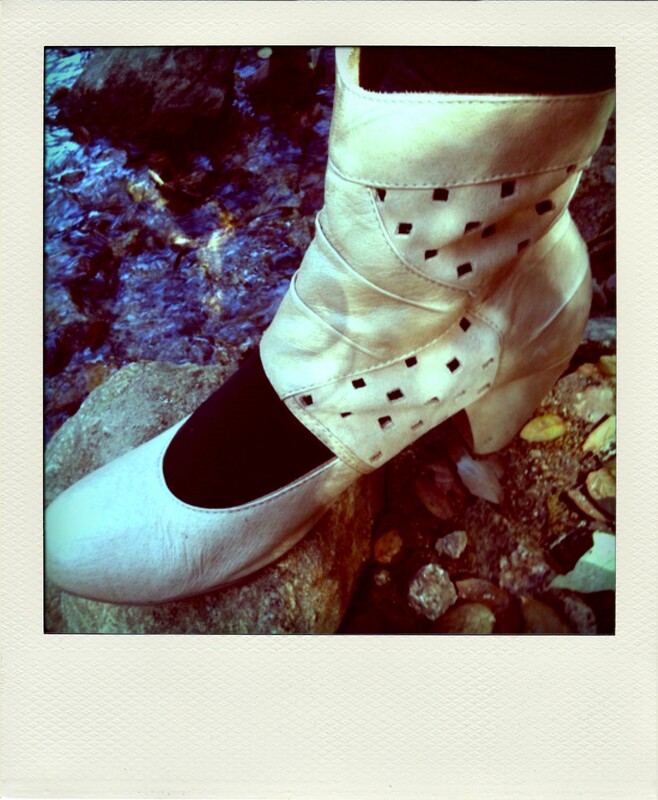 Unlike this article, when hiking in heels, one should not put the focus on their weight on the ball of the foot as most heels do not have traction; One should NEVER attempt to stand straight up, unless you regularly practice yoga, have INCREDIBLE balance and ninja like reflexes; Do bend your legs more than normal to remain balanced. 1. Take short calculated steps. 3. Grab onto whatever is nearest.